Versatile technology for Liquids, Slurries, Pastes and Solids. Display of Level, Distance or Volume. Interface detection and Reverse Interface Detection on liquids. 2 wire loop powered 24vdc or 4 wire 110/230vac. Hazardous area ATEX, EExd and EExia. HART, Profibus (PA) and Foundation Fieldbus. Suitable for narrow tanks with minimum fixed beam diameter. Unaffected by dust during fill or empty conditions. Immune to fill noise on solid products such as stone. Simple to install and retrofit with wide range of process connections. Suitable for corrosive and acidic atmospheres. High temperature and pressure options are available. Remote or local programming and commissioning. 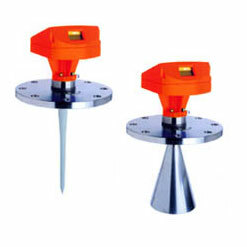 Suitable for detecting levels through surface foam. Sealed Flange system allows removal in process.